Description of "Life Changing Quotes & Thoughts (Volume 195) (eBook)"
This Title “Life Changing Quotes & Thoughts” is a series of Volumes of a series of specially collected and compiled Precious & Invaluable Quotes, Thoughts & Sayings by the great Masters Sages, Motivators, Thinkers, Philosophers, Successful persons & Leaders of the World from the beginning of time till now- with special emphasis to Human Life themes. Each & every Quote, Thought or Saying we find in each volume is really Thought-provoking & Insightful and will definitely generate a new thinking pattern to change the life of the reader in the most Effective & Positive way. Regular reading and introspection of each Thought will activate our Inner Vision & Wisdom. Let’s make it a habit to go through this Devine Gift every day for a better Life, in the days to come. With these words of introduction, we are submitting these Volumes as a regular programme of Centre For Human Perfection to the entire Humanity. Dr.Purushothaman [LivingInWellbeing], (Visionary & Director, Centre for Human Perfection, a Centre par Excellence for Mind Programming & Applied Life Themes), M.B.B.S; D.T.M&H; MS; PhD (Psycho) is currently working as a General Surgeon, Spiritual Scientist, Positive Psychologist, Life & Happiness Coach, Positive Health &Well Being Trainer, Mentor, Motivator, Master Mind Programmer,A Writer & Consultant to various National & International Organizations. Dr.Purushothaman regularly writes in many of the Indian Journals & Magazines.Also an Author & Co-author of many Motivational & Self-help Books. A regular Blogger on Wellbeing & Positive Health. 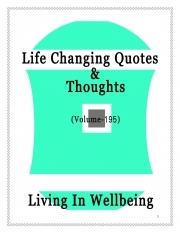 Reviews of "Life Changing Quotes & Thoughts (Volume 195) (eBook)"